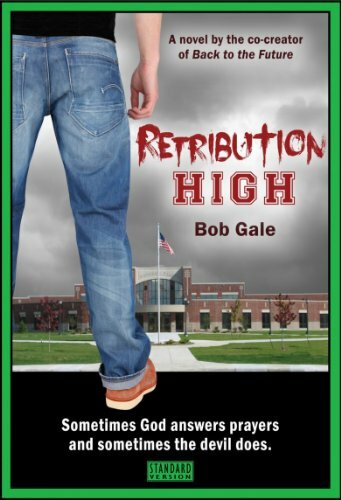 Retribution High is available in two versions, Standard (green) and Explicit (red). Both editions are priced identically, and there is no reason to own both because the story itself is identical. The novel depicts malicious teen bullies behaving badly. Very badly. The Explicit Version pulls no punches in its dialogue and descriptions. However, because many readers are offended by explicit profanity, blasphemy and detailed references to sexual acts, and because many parents prefer that their kids read books that are less than explicit, Retribution High is also offered in a slightly toned-down edition, called the Standard Version. For example, instead of using dialogue containing the "F-bomb" and its many variations, the Standard Version says "He responded with a barrage of profanity that would make a truck driver blush." The Standard Version contains none of the 68 words or expressions that can't be said on network television. As a movie, it would likely be rated “PG-13.” Other than the language and the controversial party sequence in Chapter 8, the scenes in both versions are the same. Although it's doubtful the Standard Version will appear on your church's recommended reading list, it's unlikely there's anything in it that an average 14-year-old hasn't heard or doesn't know about. But decide for yourself: click on the "Buy" link and use the "Look Inside" feature to read the first two chapters free.